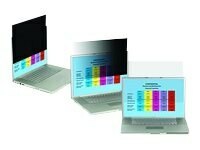 The Privacy Filters PF13.3W9 are designed to fit 16:9 widescreen notebooks with a viewable screen size of 13.3". Using 3M™ microlouver technology the filter gives full 60° privacy protection on either side, protecting sensitive information from unauthorised viewing. Easy to attach the filter can remain in place when the notebook is not in use providing additional screen protection. With a light matte finish the filter can help to reduce screen glare.